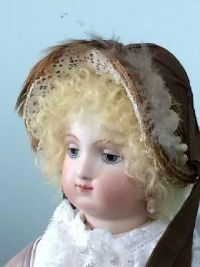 This darling hat is the same design as 039. it looks fabulous on the 16" Fashion Dolls. The front brim is tipped back in the center. The brim may be lined with lace and the top edge of the brim embelished with flowers and/or feathers. 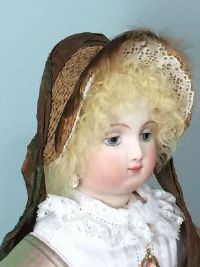 The bonnet may be fastened securely under the chin with tie extensions of the velvet ribbon that is slightly twisted and wrapped over the crest of the crown.